Yet, at least two recipients of the Nobel Peace Prize had nothing but praise for this war criminal …. As Shimon Peres said, “May he rest in piss”! That in fact would be too good a fate for him. Below, Obama’s full statement, as released by the White House: On behalf of the American people, Michelle and I send our deepest condolences to the family of former Israeli Prime Minister Ariel Sharon and to the people of Israel on the loss of a leader who dedicated his life to the State of Israel. We reaffirm our unshakable commitment to Israel’s security and our appreciation for the enduring friendship between our two countries and our two peoples. We continue to strive for lasting peace and security for the people of Israel, including through our commitment to the goal of two states living side-by-side in peace and security. As Israel says goodbye to Prime Minister Sharon, we join with the Israeli people in honoring his commitment to his country. Sharon died Saturday of a crippling illness that kept him in a state of constant comma for eight years. He was 85. Palestinian intellectuals and commoners interviewed by this writer said they were quite relieved at the death of the man they said killed so many innocent Palestinians and caused suffering and misery on a large scale. Sharon is especially reviled for the Sabra and Shatila massacres in 1982, when he, as Defense Minister, enabled Christian militiamen allied with Israel to penetrate the two refugee camps on the outskirts of Beirut and butcher hundreds of refugees. Sharon denied the allegations but the monstrosity of the massacres convinced very few people, even inside Israel, of his innocence. His visit to the Aqsa Mosque esplanade in October 2000 was seen as the main event triggering the second Palestinian intifada in which thousands of Palestinians and hundreds of Israelis lost their lives. Palestinians also believe that Sharon ordered the assassination by way of poison of the late Palestinian leader Yasser Arafat. In 2004, Sharon ordered the assassination of Ahmed Yasin, the founder and spiritual leader of Hamas. A few weeks later, Sharon approved the assassination of Yasin’s successor Abdul Aziz al-Rantisi. The ostensibly overwhelming hatred the Palestinian public harbors for Sharon seems to have made Palestinian Authority (PA) Chairman Mahmoud Abbas refrain from extending official condolence to the Israeli government. The PA might also be worried that a formal call of condolence would be used by Hamas as a “propaganda capital” against Abbas and the PA. While the PA leadership refrained from commenting on Sharon’s death, some Fatah leaders unhesitatingly voiced their deep satisfaction at Sharon’s death. “Sharon was a bona fide criminal. He is responsible for the murder of so many innocent Palestinians, including Yasser Arafat. We would have hoped to see him dragged to the International Court of Justice or the International Criminal Court to stand trial for his numerous crimes” said Jebril Rajoub, an outspoken Fatah leader and former head of the Preventive Security agency. For its part, Hamas, which rules the Gaza Strip, couldn’t hide its pleasure at Sharon’s death. Sami Abu Zuhri, a Hamas spokesperson, said the Palestinian people were more confident in victory after the death of Sharon. Shindi added: “I know that gloating over a mortal’s death is inappropriate. But the man we are talking about was not an ordinary criminal. He was our ultimate tormentor and grave-digger and I am not speaking metaphorically. Predictably, the same feeling is echoed by almost every Palestinian this writer has spoken to. Like other monotheistic religions, Islam, the religion of the vast majority of Palestinians, discourages people from gloating over the death of other people, even their enemies since all mortals will ultimately die. 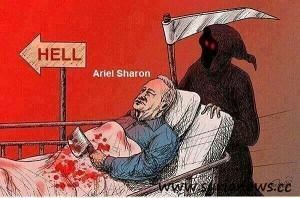 However, in Sharon’s case, there is a certain collective feeling among Palestinians in general that the man’s evil transcended reality. This is the view of Ahmed Yousef, the former political advisor of Hamas’ Prime Minister Ismael Haniya. As mentioned above, the hatred directed at Sharon is by no means confined to any specific segment of the Palestinian public. Tayseer Masalmeh is a taxi cab driver from the small town of Dura in the southern West Bank. He says that Palestinians cannot go against nature by pretending that they are not satisfied at Sharon’s death. A similar view was voiced by Walid Suleiman, editor-in-chief of Hebron Times, a tabloid newspaper published in Hebron. Suleiman, a religious Muslim, said he was sure that the eight years Sharon spent in a state of comma before his death was “a state of perdition.” In Christian and also in Islamic theology, perdition is a state of eternal punishment and damnation into which a sinful and unrepentant person passes after death. Palestinian political analyst Hani al-Masri doesn’t credit Sharon for withdrawing Israeli occupation troops from the Gaza Strip in 2005. “He didn’t do it for the Palestinians’ sake or for peace. He did it because he wanted to have as much Palestinian land as possible with as little population as possible. Masri doesn’t think there is any qualitative difference between Sharon and other Israeli leaders. Reblogged this on Informative Stats. He is dead – so what? Did that change anything? The Palestinian people will have to suffer more until they are all gone.